In the fallout of my father’s passing Ive been working from home (dont want to make anyone in the office uncomfortable with spontaneous crying and what not) and the one benefit of this is daytime television. Ok so I dont really like much daytime television but I do enjoy my occasional dose of Martha. Today looks like an interesting show with recession busting ideas and Aussie chef Pete Evans and I figured those of you not able to watch the show live might enjoy a play by play account (or not haha. This could be epic fail). So lets start the show! 1:03 Pete comes out, Im slightly disappointed with his Aussie accent. I have a few super Aussies at work and they all put his accent to shame. Oh well, theyre flipping through his cookbook to decide what to cook today. 1:05 Oh theyre cooking Huevos Rancheros and Steamed Arctic Char. Not very Aussie but delicious sounding regardless. 1:05 Wow Martha brought in eggs from her own chicken! I want Martha’s eggs! 1:06 Apprently all dishes should have color, flavor and texture. The crispy tortilla ads the texture to the Huevos Rancheros. 1:08 wow they are already done with the Huevos Rancheros and they look DELICIOUS! 1:13 OMG Pete’s fish that he brought with Australia to cook was confiscated at LAX. Epic lols. Also I just realized that Martha and Pete kind of look like twinsies, they are both wearing light purple button up shirts. How cute. 1:14 Hmm never realized how much Arctic Char looks like salmon. They are adding the soy sauce and other ingredients. Fun fact: In Australia they call green onions either green onions or spring onions. 1:15 Interesting Pete is using the garlic for texture. Wonder what hes going to do with it…fry it maybe? 1:17 Yup fried it with some red chili. Wow that was an easy recipe! Only a few ingredients and very simple. Prep time was like 5 minutes and cook was about 8! Amazing! 1:18 Ahaha Martha just corrected Pete because he kept calling the green onions shallots. Martha BUUUURNNNNN! 1:21 Ohh up now is a woman showing how to make a cardboard box and other recyclables into a toy oven! I want to make one…anyone have a kid I can borrow? Because it would be weird to make a toy oven for myself. 1:22 So the woman showing how to make the stove says one day she was in her basement and a box started to look like a stove. This woman must grow shrooms in her basement. 1:23 Aww she originally made it to cary pies in! Now I have an excuse to make one! 1:26 Wow the bottle cap knobs on the oven actually turn! 1:27 Huh using CDs for burners by drawing grooves with a sharpie. How cute! 1:30 Man, Martha must be on speed or something because she does her show in lightning speed! Either that or she is a domestic robot sent from the future to destroy us with cupcakes. Mmmm apocalyptic cupcakes. 1:32 Oops the rack inside the oven wont stay up. Martha is not amused and is scolding her guest. Im sticking with the evil Cylon Martha theory right now. 1:35 Up next things to make to go along with your toy oven. 1:40 Martha boasts that shes made more lattice top pies than anyone in the studio and then stares ominously into the camera like shes looking into your soul to make sure shes made more pies than you. 1:42 Heres some of the felt foods they showed. 1:43 Oh nice she sells kits to make her felted toys online! Click here to buy the felt pie kit for only $6! What a steal! 1:45 Martha is impressed with this guest, she compliments her neatness and says the pie looks better than the real thing. I just realized that the girl has the same haircut as Martha….I fear that Martha has made another skin job to help her quest to dominate the world with cuteness. 1:47 And the pie is done! Very cute! You can buy the kit for a mere $6 or click here to learn how. 1:52 How neat, all of the furniture is made of interlocking pieces so you dont have to glue them together to assemble. That way kids can take them apart and travel with them. The pieces are all very modern looking. 1:52 Wow the drawing of the furniture that she made for reference were done in Photoshop. My design geek heart just went pitter patter. 1:55 Wow the doll furniture is like a mini cardboard version of Ikea furniture. Everything just locks into place! Nifty! 1:58 And the furniture is done! 1:59 Well the show is over! Martha promises tomorrow will be another great show and Im inclined to believe her mainly out of fear. Im sure some of you noticed that its been quiet around these parts the past week or so. Well I wanted to update on whats going on. This a bit difficult to write, but Ive always felt that talking through what Im feeling is amazing therapy but right now I cant really bring myself to say a lot of these words out loud….so this is something I just need to write about for now. Almost a year ago my father was diagnosed with a malignant schwannoma that had spread to his brain. He had surgery last spring and it was a success and radiation seemed to have eradicated all traces of cancer. However during the holiday season we discovered that the cancer came back and had spread to his spine. The cancer spread very rapidly and the doctors decided that there was nothing that could be done. My father’s cancer was terminal and he would die very soon. Since Christmas Ive been driving to visit him and the rest of my family in Bakersfield every weekend. Its been hard emotionally to see my father who was such a strong man slowly deteriorate…but I needed to be there for him and my family. Sunday February 8th was to be my Dad’s 57th birthday and even though he wasnt eating solid foods and wasnt speaking, I had planned on making my grandmother’s Italian crepes for him. It was his mothers recipe and after she died almost 7 years ago from Alzheimers, he has not smelled or tasted his mothers crepes since no one in my family had been able to master the recipe. Unfortunately Saturday night just 1 hour before his 57th birthday my father passed away quietly and surrounded by loved ones. I cant even begin to explain the heartache Im going through, its a loss unlike any loss I have experienced before. I always knew that one day I would loose my father, I just had no idea it would come so soon. Part of me is devastated and almost angry for all the things I will miss out on. I wont have the opportunity to have my father walk me down the isle, come to my house for Christmas dinner or hold my future child. Im heartbroken that my mother…his wife of over 30 years, will have to retire alone. But at the same time I know that I am fortunate to have had such an amazing father for 24 years…many people I know never knew their fathers or had horrible dads, so Im thankful for my dad even if the time was short. Im also thankful for the lives he touched. As a teacher for 30 years lower income children and adults he had an amazing impact on their lives, Ive been reading the online guest books for him and am overwhelmed with the sheer number of people writing about how much they loved my dad. His memorial service had over 300 people! We were all lucky to have my dad even though our time with him was cut short. The day after my dad passed away I decided to go ahead and make his mothers crepes as I had originally planned. Even though my grandmother’s recipe is very vague (uses words like scoop and pinch and was more of an ingredient list than anything) I was able to make 2 batches of crepes and some sweet and spicy sausages. When we sat down to dinner my family toasted my Dad and wished him a happy birthday with tears in our eyes. To my surprise and delight the crepes tasted exactly like my grandma’s! I overstuffed them a bit because I didnt take into account the filling expanding when I cooked, but otherwise they were perfect. My mom said that Dad would be proud. I would share the recipe with you all, but its my grandma’s secret recipe so I cant go about putting it up online for the world to see ;) However I am devising some of my own crepe recipes and I’ll share them with you later. I promise I’ll catch up on all the blogs Ive been meaning to write, Ive got about a dozen floating around in my head right now and I just need the time to write them all out. I love you Dad and I miss you so much, you always encouraged me to write and read my blogs…I like to think that somewhere out there your spirit is still reading them. This is for you Dad, I love you so much. Make your own vegetable pasta! As many know, I am on a wheat free diet for medical reasons so often I find myself having to come up with substitutes for my dishes. Im Italian so I love pasta dishes, but Ive never really liked the taste and texture of pasta…its too bland and gummy. Enter veggie pasta. Veggie pastas are when you use a vegetable to simulate the pasta in your dish. Its far more healthy than the carb rich noodles and I find it much more tasty. 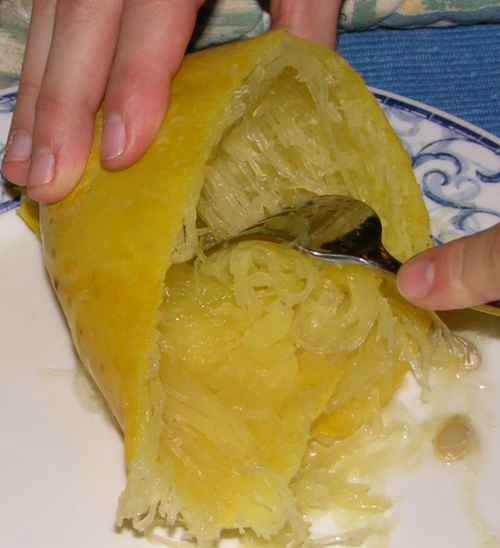 The easiest to prepare and most popular is spaghetti squash. The large gourd is cheap and all you have to do is cut it in half, boil it and then scoop out the meat with a fork and it will fall out like noodles. Cool huh? I use this all the time when I need spaghetti noodles and frankly I like it more than regular spaghetti. Its got a more firm texture and a flavorful nutty taste. Im a big fan of just tossing the noodles with some olive oil and garlic then sprinkling with some fresh Parmesan cheese. One of my recent discoveries has been the use of zucchini as noodles. All you have to do is take a zucchini and cut the ends off and peel the skin. Then using a potato peeler slice long even strips of the zucchini. About 2 average sized zucchinis makes enough for one serving. Once you have a big pile of zucchini noodles you can either quickly boil them our lightly saute them in oil. Be careful not to cook them too long or they will become soft and mushy. All you need to do is get them nice and hot, any longer than that and they will loose their noodle-like texture. I really like using them in a chili and soy stir fry but you can use them in any recipe that calls for flat noodles. So enjoy the healthy and delicious taste of veggie noodles!